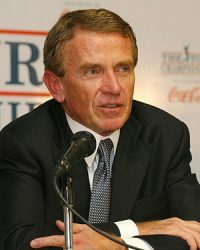 A graduate of Virginia Law School and a member of the Carter Administration, Tim Finchem served as Commissioner of the PGA Tour from 1994-2016. Under Finchem’s guidance, the PGA Tour experienced tremendous growth in every area, including record purses, revenues and tournament attendance. The creation of the President’s Cup, the World Golf Championships and the Fed Ex Playoffs occurred under Finchem’s watch. Under Finchem’s guidance, the PGA Tour’s annual contributions to local and national charities skyrocketed. Several other golf initiatives, including The First Tee and the World Golf Foundation, came into existence under Finchem. He also played a leading role in golf’s return to the Olympic Games.